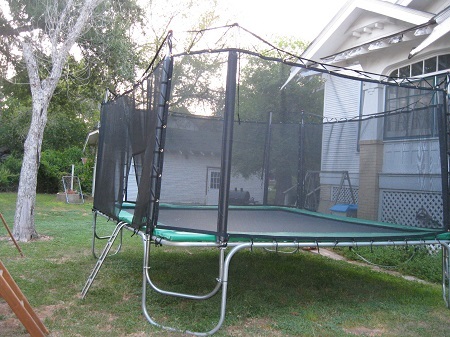 "THE TEXAS CAGE" (15/15) trampoline enclosure fits our 15'x15' or 14'x14' "Texas Square" trampoline. Structural steel poles are galvanize coated inside and out for corrosion resistance. Padded poles w/20oz. vinyl covers (NOT CHEAP PLASTIC FROM CHINA!) and advanced "NO-CLIMB" net protect you from falls. Our enclosure net Panels are designed to fit right! No complicated net adjustments. All parts designed to withstand UV and weather exposure. Easily assembled with small hand tools. Printed and photo instructions included. 2- year limited warranty. -Pole Covers and Net Panels are Black in color. Optional pole colors are available for a upcharged price. Contact us for details.